Order your Lamy ABC Fountain Pen today from FahrneysPens.com. Fine Pens, Refills & Luxurious Gifts – great prices & fast shipping. The Lamy ABC Fountain Pen for beginners is the second phase to the new Lamy system for young writers that starts with a beginner's pencil and graduates to the child-friendly ABC fountain pen. The ABS fountain pen was developed in cooperation with educational experts to help kids make the first steps in learning to write. The special design has an ergonomically shaped grip to assist natural, relaxed positioning of the fingers. The Lamy ABC beginner's pen with steel nib is made of maple wood with a non-slip, rubberized plastic grip. 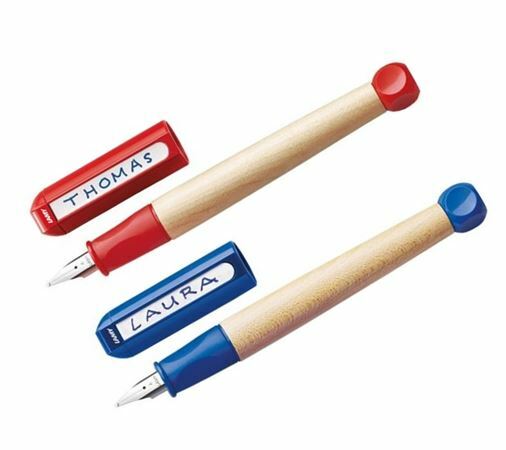 The plastic cap in blue or red and comes with a sticky label to put your child's name on the clip. ABC fountain pen is also available with a special nib for left-handed writers. Specify color and right or left nib when ordering. The ABC fountain pen uses cartridges only.